For the beverage, see Es kelapa muda. 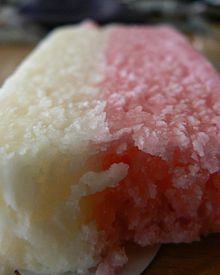 Coconut ice (sometimes Cocoanut ice) is a British confectionery prepared using grated desiccated coconut or just grated coconut, condensed milk and sugar, which is formed to create a solid, soft candy. It typically has a chewy, soft and mildly grainy texture; some versions are semi-hard. Coconut ice is also available in some areas of Australia and New Zealand. Pink food colouring is sometimes added, often on only part of the sweet, resulting in pink and white colouration. This is done by layering the coloured mixture with a separate layer of uncoloured product, and then slicing the result into individual pieces. In modern versions, honey gelatin is sometimes also used as an ingredient. Coconut ice was traditionally prepared at home in Britain, traditionally using coconut and boiled sugar syrup. Early versions using sugar syrup had a short shelf life, sometimes dried out and became excessively grainy in texture, and sometimes fermented. The origin of use of the word "ice" in the confectionery's name is not known, but it may have derived from its general appearance and colouration. An Australian recipe for "cocoanut ice" [sic] included the ingredient copha, an Australian form of vegetable fat shortening made from hydrogenated coconut oil also referred to as "white cloud". In America, a similar pre-packaged confection is sold under the name Neapolitan Coconut by Brach's and similar names by other confectioners. They typically add a third layer that is flavored with chocolate. ^ Steel, Florence Annie Webster; Gardiner, Grace (1888). "Cocoanut Ice". The Complete Indian Housekeeper and Cook: Giving the Duties of Mistress and Servants, the General Management of the House and Practical Recipes for Cooking in All Its Branches (2010 reprint ed.). Cambridge University Press. p. 294. ISBN 9781108021937. Retrieved 30 November 2016. ^ a b c d e Jha, M. (2003). Modern Technology of Confectionery Industries with Formulae & Processes (2nd Revised Edition):. NIIR Project Consultancy Services. p. 180. ISBN 978-81-7833-099-0. ^ Mottershead, B.; Woods, L. (2003). Food Technology. Create! (Oxford, England). Heinemann Educational Pub. p. pt74. ISBN 978-0-435-41218-0. ^ a b c d e Davidson, A.; Jaine, T. (2014). The Oxford Companion to Food. Oxford Companions. OUP Oxford. p. 204. ISBN 978-0-19-104072-6. ^ a b Greenwood, H. (2014). Life is Sweet: A Collection of Splendid Old-Fashioned Confectionery. Ebury Publishing. ISBN 978-1-4070-2987-0. ^ Angelo, D. (1998). Australian Phrasebook. LONELY PLANET AUSTRALIAN PHRASEBOOK. Lonely Planet. p. 83. ISBN 978-0-86442-576-8. ^ Veart, D. (2008). First Catch Your Weka: The Story of New Zealand Cooking. Auckland University Press. p. pt173. ISBN 978-1-77558-068-3. ^ "Coconut ice squares". BBC Good Food. April 5, 2011. Retrieved November 3, 2016. ^ "The 'cocoanut' ice challenge". The Cook and the Curator. Sidney Living Museums. 20 November 2014. Retrieved 30 November 2016. This page was last edited on 11 October 2018, at 17:13 (UTC).